WIKA and EVG have partnered since 2012, collaborating on B2B content strategy, production and social media management. "Some executives scoff at the idea that content can help convert into customers. EVG has helped us prove that customer-focused content opens doors many times faster than just having a product brochure that looks and sounds like all others. EVG has been instrumental in helping us create insight and transmit it to customers, reframing our offerings in the process." Be recognized as a thought leader in the industry. Increase brand awareness and customer loyalty. Strengthen published content to stay top-of-mind for customers. Provide key decision-makers with strategic content. Their management recognized a need to break from a strategy based on buyer assumptions, which had led them to focus on product brochures and similar collateral. They needed to turn WIKA’s insights and expertise into knowledgeable, thought-provoking content industry veterans would read and could act upon. But they also realized their in-house team needed help vis-à-vis additional bandwidth in order to accomplish those goals. That’s when WIKA turned to EnVeritas Group as a content creation partner to move the needle. Overnight success is a myth, and it can’t be achieved without a plan. WIKA’s team recognized brochures and spec sheets had become their primary source of product information. While these types of content do fulfill a need, being recognized as a thought leader requires a stronger content foundation. EVG’s first task was to gauge the need for a different type of content and evaluate the gaps in WIKA’s current content. The result was a Content Strategy & Gap Analysis to determine a clear and sound roadmap for information on and off the website. EVG makes the extra effort to listen to the client’s specific needs before starting work on an assignment. Industrial topics can be difficult to deal with for marcom/PR folks, but EVG has tons of experience working on heavy industry topics to navigate well through them and to deliver a great finished product within the scheduled time slot. WIKA’s marketing team understands the critical importance of measuring, whether it’s gauging pressure or proving customer-focused content opens doors much faster than a generic product brochure ever could. EVG worked with WIKA to develop a strategic process to measure Key Performance Indicators in order to gauge the success of the new strategy. 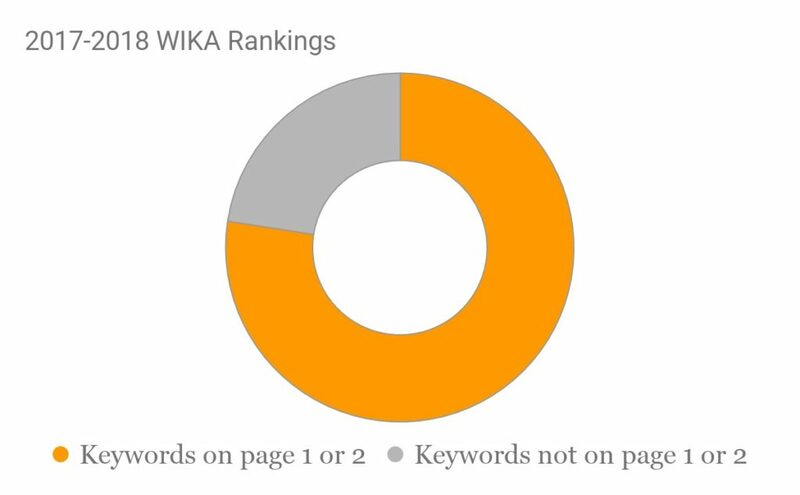 Objective KPIs, such as share of voice in search engine results, measure how effective a content strategy is working in terms of getting that information, and WIKA’s message of expertise, in front of decision-makers in targeted industries. The initial leading KPI was search engine results: page one ranking for a specific list of search terms (keywords). 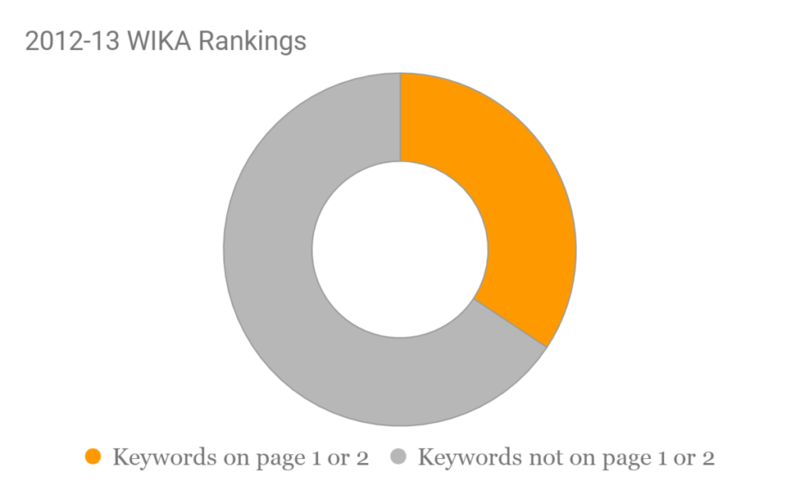 In 2012-2013, WIKA targeted 67 keywords, 23 of which were organically ranked on page one and page two. At the end of that period, EVG was able to show that these terms were moving up in rank on results pages. However, the client asked EVG to demonstrate that the change in ranking was due to the new content and not other factors. Because the new content, with targeted search terms, was placed on webpages being monitored through Urchin, EVG was able to demonstrate which content elements were working and which weren’t. EVG’s SEO specialists did this with a careful and thorough analysis of data, including page traffic and bounce rate. Pages with EVG content outperformed similar pages with content that had not been refreshed or rewritten. The results speak for themselves. Since the start of the partnership, EVG has continued to monitor the list of target search terms. In 2017-2018, there are 93 terms on the list: 60 of the terms are organically ranked on page one and an additional 12 terms are on page two. One of the keys to this successful partnership is a commitment to communication. Bi-weekly conference calls between the EVG and WIKA teams ensure issues are addressed in a timely manner. What’s more, these regular meetings are when new ideas are raised and each team has the opportunity to learn about new developments in the other’s field of expertise. Rather than waiting until year-end before issues are addressed, both teams can make small course corrections as problems are first identified. At the end of each year, EVG creates a formal report documenting the successes and challenges of the previous year. Using hard data from analytics, EVG’s SEO specialists outline recommendations for the coming year. Together, this process provides everyone with the necessary information to make decisions rooted in data. Excellent piece of information on our Flex-R design. This should be mandatory for our entire sales organization! I liked [the article] so much I forwarded to Ansgar [Global Market Segment Manager-Oil & Gas] in Germany.